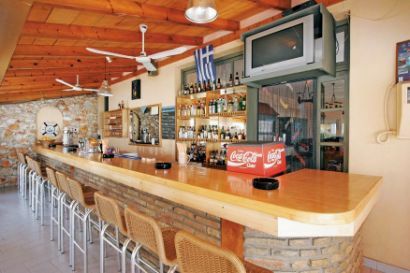 The Paspalia hotel is a relaxing place to stay with what many would call a traditional Greek vibe. Nestled in alongside a stunning beach the Hotel Paspalia couldn’t have a much better location. To its rear you have views of the forest giving ample opportunity for relaxing walks in the sun. The rooms are distinctly Mediterranean, clan and fresh and the hotel restaurant services traditional greek dishes of the highest quality. The poolside bar offers snacks during the day and there is a shady terrace for al fresco dining. Close to the resorts heart this is one of Skala’s top places to stay. 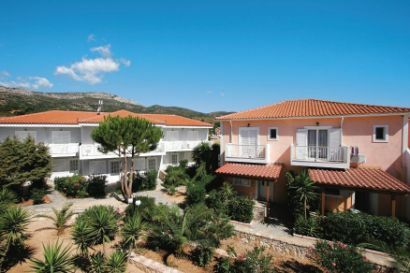 All rooms have air-conditioning, telephone, fridge, hairdryer and balcony or terrace. Daily maid service and linen change twice weekly. Standard rooms have 2 to 4 beds. In the UK, this hotel is only available from the Thomson group. 1. 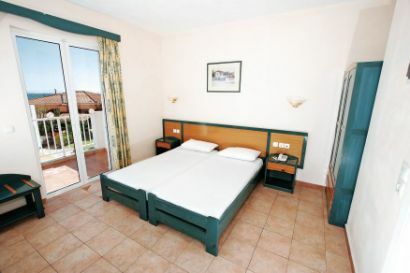 You can check the Paspalia hotel availability and package prices at Thomson Holidays. 2. 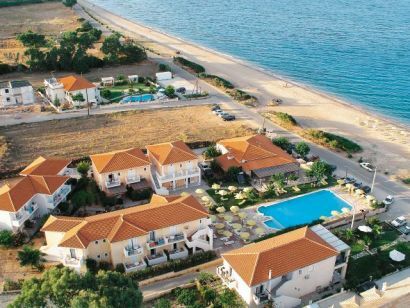 You can also book and check prices at Paspalia hotel with Sunshine.co.uk the cheap holiday specialist.